When CRFs first arrived on the British market they were a departure from the norm. However, UK-led research projects were very useful in helping growers to gain confidence in using this new technology, recalls consultant John Adlam. Reflecting on the impact that CRFs have had on the UK’s commercial growing industry, horticultural consultant John Adlam recollects: "We were introduced to CRFs in the 1960s. At that time there was a very cautious uptake by growers of the concept of controlled release. It was quite a departure from what they were familiar with and it probably took ten years before they were accepting of it. But that meant that the grower didn’t have to liquid feed. Considering everything else that they had to do on the nursery, there were some labour-saving concepts that came with CRFs." Adlam, a council member of HTA, also notes that using CRFs considerably reduced the release of nutrients into the environment. "The risks of ground water and surface water contamination are much lower," he points out. He adds that CRFs have also provided the UK’s horticulture industry with good nutrition in its growing media, particularly throughout the transition from peat-based to reduced-peat mixes. Interestingly, Adlam recalls how working with CRFs was at first a bit of a learning curve for growers. "Early work carried out at the Efford Horticultural Research Station in Hampshire was very useful in helping growers to identify which products suited their requirements and how to utilise them effectively," he says. "There was also an interesting public dimension to it — people weren’t aware of what they were. I can remember having people ring me up to say: ‘I have found these little balls in my soil. I think they might be slug eggs.’"
Adlam notes how further research carried out at the Glasshouse Crops Research Station in West Sussex in the 1970s, and in Efford in the 1970s and early 1980s, continued to give growers a good understanding of, and confidence in using, the products. He also observes that, decades after CRFs were introduced to the market, the way in which CRFs are applied remains a subject of debate. Adlam advocates the use of the dibbling method — as opposed to having CRFs pre-mixed into the growing media. He believes that this method avoids the risk of making mistakes, such as accidentally putting the wrong growing media in the pot during a changeover period. "You can ‘add it to taste’," he says. "I personally feel that this is something we should consider a lot more seriously because of the flexibility it gives you in the application of the CRF. If, for example, a grower pots small quantities of a large number of species, the dibbling allows you to adjust the CRF application accordingly." He also notes that the period between mixing CRFs into the growing media and potting up a batch "has got a use-by date." He adds: "Certainly, with CRFs you should not purchase products that you cannot use within three weeks of delivery." Nowadays, notes Adlam, there is "a wide range of CRF products available from many different countries". He says: "We would all consider Osmocote to be the leading brand." He concludes by noting that the EU’s current revision of its fertiliser legislation, which requires the CRF coating to biodegrade after two years, means "the industry is going to have to continue to adapt and innovate to meet these requirements". He adds: "It will be interesting to see what they look like and how they will work in future." This is content produced in partnership with ICL. 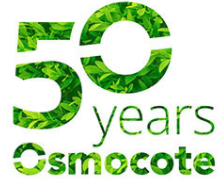 Read the full story of 50 years of Osmocote here. As Osmocote celebrates its 50th anniversary this year, Rachel Anderson examines how the brand's continuous product development is helping commercial growers to fine-tune their crops' nutritional needs. From helping to create a tailored fertiliser regime for specific nursery crops to reducing fertiliser wastage, Osmocote's CRFs offer commercial growers many benefits, says ICL. Thanks to ICL's significant investment in research and development, growers have an increasing number of Osmocote solutions to grower challenges from which to choose. Keen to tailor nutrition as closely to each crop's needs as possible, Woodlark Nursery uses Osmocote as part of the business' precision nutrition programme. Retail plants case study: Osmocote: "It makes a huge difference." Osmocote fertilisers continue to provide Patrick Morgue with peace of mind in the ever-changing and fast-paced horticulture market. To celebrate Osmocote's 50th anniversary, ICL in the USA hosted a contest to identify the nursery that had used the fertiliser the longest. Established Australian grower Heyne's Wholesale Nursery uses Osmocote Exact to maximise the saleability of its stock.